Providing you the best range of round wire drawing die, diamond drawing die and diamond die with effective & timely delivery. Round Wire Drawing Die are tools with highly-polished, specially-shaped holes through which wire is drawn to reduce its diameter. They have a metal case and a nib made of carbide, polycrystalline diamond (PCD), or natural diamond. When selecting wire drawing dies, wire material and drawing parameters are important specifications to consider. Examples include standard wire drawing dies, PCD wire drawing dies, Carbide wire drawing dies, and enamelling wire drawing dies. Standard wire drawing dies have a well-defined reduction angle that reduces drawing force and provides uniform die-formation with a consistent surface finish. PCD wire drawing dies to use a polycrystalline diamond (PCD), a synthetic material which provides superior resistance to cracking and wear. Carbide wire drawing dies are made from tungsten carbide, an extremely hard and scratch-resistant material that is often used in tool bits. Tungsten carbide wire drawing dies are often used to draw thicker wires, and in applications where PCD dies are too expensive. Wire drawing dies are used with a variety of wire drawing tools and equipment. Are pull-in dogs used to grip a wire?send as it enters the die. After the pull-in dog is fastened to the block, the wire is drawn through the die. Wire drawing dies are also used with both single-block and multiple-block machines. With single-block equipment, the wire passes through a die and collects on a standard block. With multiple-block machines, the wire is pulled through a die and wrapped around a slightly-tapered block. The wire then moves upward onto collector pins and exits the upper section to reduce back tension. Carbide Dies can also be made as per customers requirement. We are engaged in manufacturing, supplying and exporting Diamond Drawing Die for our esteemed customers. 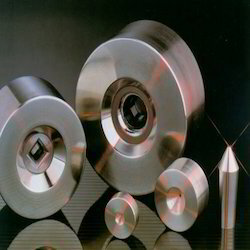 The offered dies are precisely designed using high-grade metals that are procured from established vendors of the industry. 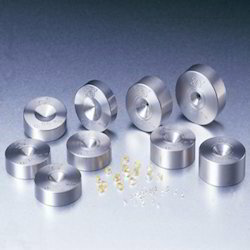 These dies are dimensionally precise and made available at competitive prices. We are among the industry veterans, engaged in offering Diamond Die to the customers. 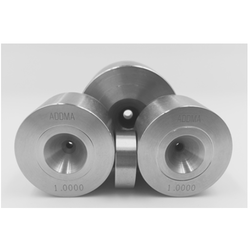 These dies are precise in terms of dimensions and are rendered an optimal surface finish. We make these dies available in several specifications to fulfill the diverse demands of the customers. Customers are reasonably charged for these dies.